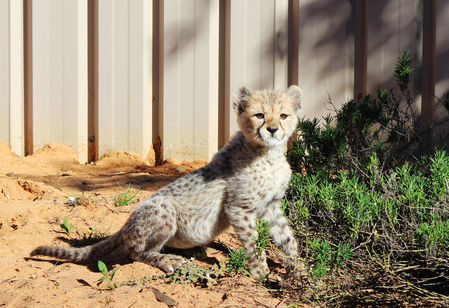 There's a new face at Monarto Zoo, a gorgeous baby cheetah has been born to one of Monarto Zoo's residents. The three month old is just starting to make her way out in public, and will likely be a popular site during the school holidays. She was born in a litter of just one, and as a result she is being hand reared so that she doesn't starve. In the wild a sole cub wouldn't be likely to survive. The boisterous and playful cub is a bundle of energy, and she's already gearing up for her fast cheetah speeds as the bounds around the enclosure. There's no guarantee you'll be able to see her every day, as she's still just getting used to the public, but if you get the chance she's not one to miss.